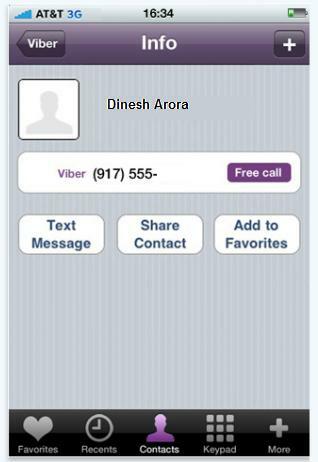 Viber Text Message Free | Viber Free SMS | Viber Free Text | Free Pc to Phone Calls, Free Voip Calls to India International ! If you are having a smartphone viz Android, iPhone, Blackberry, Nokia, Windows Mobile then you should definitely be using Viber app on your mobile. Viber is one of the most popular iPhone Voip applications. It is also getting popular on android mobile and for PC users there is no official app. However we have already posted a tutorial on how to use Viber for PC. Viber voip application allows users to make Viber Free Mobile calls over internet using Wifi or 3G connection and the calling is really very easy! Now Viber Media, the group behind this iPhone App has launched Viber 2.0 adding some very good features of "Free Viber Text Messaging". Viber 2.0 is simple upgrade of its previous version Viber 1.0. Viber 2.0 adds the ability to text message other Viber users free of charge. This is a really nice feature of Viber application, that is sending text messages free using Viber. Offcourse you would say that there are plenty of iPhone and android applications which allows free text but it is certainly nice to have one single application which allows to make free calls and send free text. You are relieved from the pain of managing so many applications. You will see a new tab for Messages in Viber 2.0. In this menu, you can see messages sent to you by your viber friends, and you can send messages as well. Another good thing about this is Push Notification for the Free text messages (when they receive a text or SMS). The Viber Text Messages feature is similar to Whatsapp for smartphone, however as said before having everything in one app helps for sure. Additionally, Viber is currently launched for blackberry and windows phone as well. The Viber for Blackberry app just have free SMS feature enabled. The calling feature is still not there. Viber free sms can save you lot of money and you can avoid sending telecom provider sms. Please note that you can send free text message from your Viber app to your friend also using viber on his mobile. All it requires is internet connection. Both of you need to be online in order to send free text message from viber. Some other improvements have been made in Viber’s calling mechanism. When users place a call, you will see ‘Calling’. Once the other party’s Viber app has been contacted and it begins ringing, Viber will now show ‘Ringing’. Viber Free Sms service is also one feature which will help getting more users. Viber is proving to be a good Skype Alternative for iPhone. If you are using Viber Free Text Messages and facing any problem, then please post it in the comment section. We will try to solve all your queries regarding Viber! Thanks for sharing, I'll try to download it later. Hope to see more iphone apps source. This is Viber to Viber which is FREE. Not Viber to phones/mobiles. The free Viber application capable of placing and receiving free calls over WiFi and 3G has gained text messaging functionality, which is also free among owners of the free iOS application for iPhone.